Though no date has been set for his return to active duty on the mound, the Los Angeles Angels expect Japanese right-hander Shohei Ohtani to pitch again some time before the end of the season. “I’m not going to put a date on it. But we’re going to get him out there before the end of the season, we hope,” he added. The Angels have 35 games to play. The two-way player has been utilized solely as a designated hitter or pinch hitter. He hasn’t thrown in a game since injuring his elbow on June 6. He was diagnosed with a Grade 2 tear of the ulnar colateral ligament in that elbow, often the precursor to Tommy John ligament replacement surgery. Ohtani threw 30 pitches with Arizona Summer League hitters standing in and without incident at the Angels’ spring training facility in Tempe, Ariz., on Monday. That outing followed a bullpen session at Angels Stadium in Anaheim this past weekend. “He’ll repeat that workout [on Wednesday] and we’ll see how it comes out,” Scioscia said Tuesday before the Angels dropped a 5-4 decision to the Arizona Diamondbacks at nearby Chase Field in downtown Phoenix. “If he gets through that we’ll try to expand it to a 45, 50-pitch mark in a workout. Because Ohtani is not on the disabled list, he would be unable to go to the minor leagues for any rehab starts. “We want him to continue hitting, so we’re going have to do this on different terms,” Scioscia said. Ohtani returned as a hitter on July 3. Since then, he’s batting .243 with seven homers, 18 RBIs, five stolen bases, 11 walks and 38 strikeouts. Without the DH in National League parks, Ohtani is reduced to pinch-hitting duties, during the two-game series at Arizona. Tuesday night, he lined out to center on the first pitch from Archie Bradley with one man on and none out in the eighth inning. Overall, he has a slash line of .267/.347/.520 with 13 homers, 38 RBIs and an.867 OPS in in 221 at bats. It has already been more than two months since Ohtani received stem cell and platelet-rich plasma injections in the elbow. Ohtani went on the disabled list June 8. Upon his return, he was cleared to hit, but wasn’t told he could begin throwing until just after the All-Star break. Last season, in Japan, the Nippon Ham-Fighters negotiated Ohtani’s playing time as he dealt with ankle, hamstring and evidently the elbow injury. A right-handed pitcher and left-handed hitter, he was limited to 25 1/3 innings off the mound, but made 231 plate appearances. After last season he had a PRP shot in the elbow and was diagnosed with a Grade 1 sprain of the UCL. The Angels were aware of this when they signed him to a contract this past December, paying him a $2.31 million bonus, the minimum of $540,000 and a $20 million posting fee to the Fighters. Because of the elbow, the Angels had been trying to manage Ohtani’s pitching. His last four-inning start on June 6 was just his second in 17 days. He has thrown only nine innings since May 20. For the season, he’s made only the nine starts and is 4-1 with a 3.10 ERA, 20 walks and 61 whiffs in 49 1/3 innings. He had a high-water mark of 7 2/3 innings and 110 pitches in a home win over the Tampa Bay Rays on March 20. 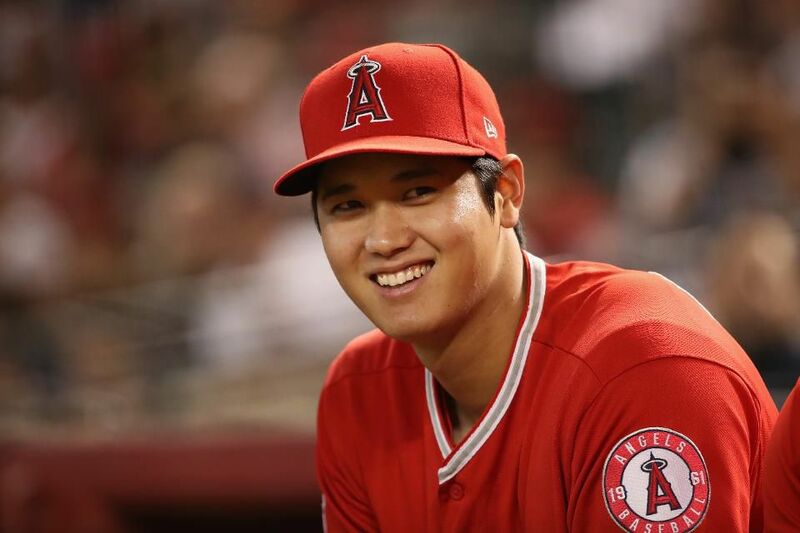 Scioscia said Ohtani has yet to fire on all cylinders in his latest practice outing, what he has called this season “a full gorilla bullpen” session.